As I mentioned in a previous post, I had a very lovely and kind reader named Anca send me her backup bottle of Essence “Blue Addicted”. 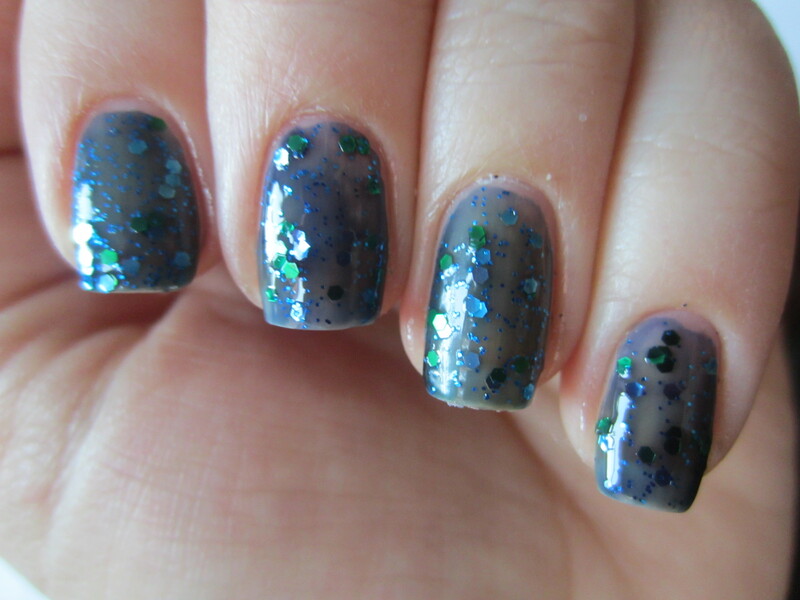 To read my review of that polish, you can check it out here! She sent the polish to me so I can do a comparison post between Deborah Lippmann “Across the Universe” and the Essence supposed dupe. Across the Universe is one of my all time favorite polishes, so I’ve been on a personal hunt for a good dupe so I can save myself some money buying another bottle. I know that a ton of people have done this type of polish already, but I had to know for myself if they really are dupes! So for all of you who haven’t seen these two polishes compared, here ya go! I know the Essence polish was limited edition, but maybe you can find it at your local store and save yourself $16. Are these 2 really dead on dupes? Keep reading to find out! The biggest differences come with the first coat, so I had to take a picture. While you may not see a huge difference, there is a slight difference thats apparent with the first coat. The Deboral Lippmann had a slightly darker base and has a lot more green glitter. The green glitter could be just my application, but it shows on all of my nails so I’m taking that as a sign. The differences are slightly more apparent from this angle, but they are so slight that I’m prepared to call them dupes. 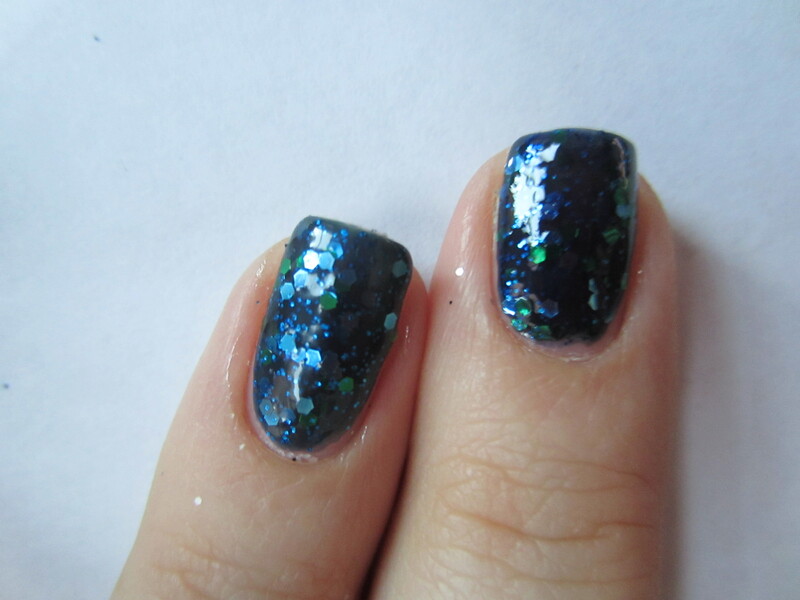 Across the Universe has a little bit more depth to it, which I think comes from the navy jelly base being slight darker. This picture shows the differences a little bit more. But honestly I think my application was slightly thicker on the middle finger. Formula wise, these polishes are pretty similar as well. The Deborah Lippmann dries slightly faster, but its so slight that if you aren’t really trying to find a difference (as I was), you wouldn’t notice. Both were opaque in 2 coats, tried a little bumpy, and needed 2 coats of top coat to make them completely smooth to the touch. I’m calling them dupes! This is the second post I’ve ever done where I’ve called a polish a dupe for a high end polish! (to see the first one, go here!) If you guys are looking for a dupe of Across the Universe, hopefully you can track down a bottle of Essence “Blue Addicted” on ebay or somewhere else online. Even with buying it on ebay and paying for shipping it would be less than the $18 price tag of Across the Universe. What do you guys think? Which do you prefer? 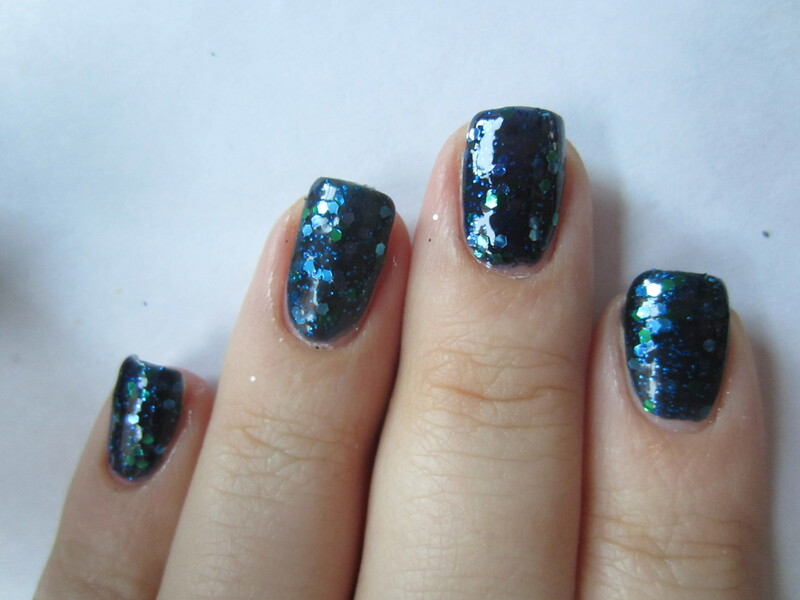 Do any of you have Blue Addicted or Across the Universe? ← Color Club Halo Hues 2012 Collection! Amazing, really. I’m always blown away by such close dupes. You figure the high end brands are in development for what one? two years? Thanks for the post!!! I really love Essence polishes and I believe they are great dupes! I have blue addicted and I love it! It’s great for layering or a sandwich mani. oh i might have to try out a layering combo with it! thanks for the suggestion!